However, even this good endeavor called to overcome divisions in the Ukrainian society met with cynical attacks and unfair accusations on the part of the Ukrainian Greek Catholic Church, which used this event to launch new vicious accusations against the canonical Ukrainian Orthodox Church. The UGCC Supreme Archbishop Sviatoslav Shevchuk gave an interview on July 24 to the UGCC Information Department, in which he stated that the All-Ukraine Procession with the Cross is a political pro-Russian action. According to the archbishop, ‘the Moscow Patriarchate has often been used as a tool in the hands of the aggressor’. The head of the UGCC compared the procession to ‘a living shield made of civilians’ and warned that ‘if there are anti-Ukrainian slogans and provocations coming from the midst of participants in this procession with the cross, this will become an end of the Moscow Patriarchate in Ukraine’. The archbishop did not even stop at saying that among the Moscow Patriarchate clergy ‘there are many facts of behavior incompatible with the title of the citizen of Ukraine, and the Ukrainian Security Service should deal with them’. These statements by the head of the UGCC, unbecoming not only to an archbishop but also to a Christian in general and aimed to enkindle inter-confessional strife and made in the genre of political denunciation cannot but provoke resentment and disgust in the hearts of the Orthodox faithful. Unia, which was imposed by fire and sword for centuries, today too demonstrates its animosity towards Orthodoxy. Again and again, contrary to the agreements achieved through great efforts on the high level between the Orthodox and the Catholic Churches, systematically and consistently impeding a reconciliation between East and West. 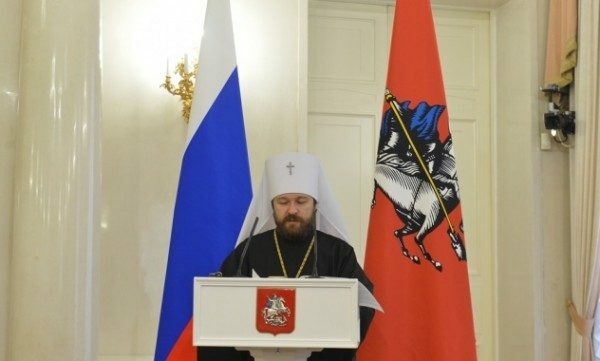 Due to the rhetoric of the UGCC Supreme Archbishop Sviatoslav Shevchuk and Cardinal Lubomir Husar, unprecedented in its aggressiveness towards the canonical Ukrainian Orthodox Church and the Moscow Patriarchate on the whole, the Department for External Church Relations of the Moscow Patriarchate believes it an emergency task to revisit the issue of canonical and pastoral consequences of unia at the next plenary session of the Joint Commission for Orthodox-Catholic Dialogue planned for September 15-22, 2016, in Chieti, Italy. Is it possible to hold dialogue with the Roman Catholic Church on other theological issues at a time when the problem of unia continues to be a bleeding wound while the leaders of uniatism do not stop their blasphemous and politicized rhetoric aimed against the canonical Ukrainian Orthodox Church? Dialogue on the canonical and pastoral consequences of unia, forcibly interrupted through the fault of the Greek Catholics, should be resumed without delay.